This secluded kozy Kottage on Lower Scott Lake is a perfect place for a family get away. Only about 2.5 hours from Chicago. This cottage has a private dock, with a 123' of lake frontage, surrounded by beautiful trees. Sit out on one of the 2 decks overlooking the lake. Enjoy a family dinner in the dining room or on the deck, or just sit in the family room and enjoy the view. The lake is approximately 140 acres and is a all sports lake with an easy access boat launch less than a mile away. Launch your boat and dock at your own private pier. Enjoy fishing, water skiing, boating, jet skiing and swimming. In the evening enjoy a campfire and a star-filled night. South Haven and Fennville are about 15 minutes away while Glen, Douglas, Saugatuck and Holland are all less than a half hour away to explore and enjoy. Sleeping arrangement: Main bedroom has a ceiling fan and queen size bed, with a TV, the second bedroom has a double bed. Alcove with a twin daybed. Family room with spectacular views, 2 sofas, a double futon. * The single floor dwelling accommodates 5 to 6 guest comfortably, including children. * Family room with a beautiful view has flat screen TV, DVD player and mini stereo. * Open floor plan, well-equipped kitchen with a breakfast bar for 3 guests- just bring your food. * Bathroom with single bowl vanity and shower. Take a break from Lower Scott Lake and head to the big lake: Lake Michigan! Take a short drive away is Saugatuck. This is a popular vacation destination in MI. Here you can experience the Satugatuck Dune Rides, the Oval Beach, Butler Street (local art and boutiques), and the Tabor Hill Wine Port (large selection of wine and samples). See the only hand-cranked chain ferry left in the country, the Saugatuck Chain Ferry! This victorian ferry is one of the top tourist destinations in the area. The National Blueberry Festival is in South Haven. Some of the best golfing is at Beeches Golf Course. 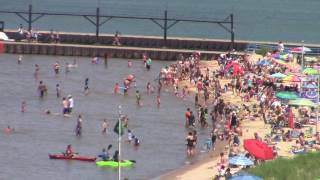 Lake Michigan Beaches? 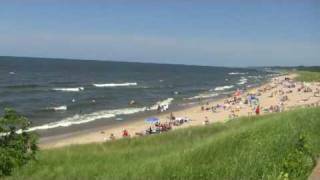 Yes, there are several to the North and South - South Haven beaches are just 15 minutes away! June 1-June 29 2019 $180 a night with a min 3 nights plus $100 cleaning fee. Monday - Friday $700for a 5 day 4 night stay plus $100 cleaning fee. Week stay only $1600 plus $100 cleaning fee. 3 night min stay 200.00 a night, pulse 100.00 cleaning fee. Week stay $1400 plus $100 cleaning fee. $250 refundable security deposit and a $100 cleaning charge required. Payment via personal check. 50% deposit due 7 days from conformation. 50% balance due 2 weeks prior to check in. $25 charge for every 15 min. late check out, $100 per hour, etc. Early check in prohibited without prior authorization. Refundable deposit (less $50 processing charge) with sixty(60) or more days notice of cancellation prior to check-in., one half of deposit is refundable. No refunds for cancellation within 30 days of check-in date from 31 to 59 days prior to check-in.